It is pretty much a given that most Horseplayers and Horsemen alike know that the drug problem in horse racing isn't about what is tested for, but what isn't tested for. The use of performance enhancing drugs hurts Horseplayer confidence and it also drives out owners, even trainers and potential new owners as the playing field just doesn't seem level. Keeping up with designer drugs is nearly impossible for regulators. By the time one is discovered and banned, another new one comes along and replaces it. The solution has to be tougher penalties. First, there has to be an approved list of drugs that can be used, and only the drugs on the list can be used. Barns caught using drugs not on the list have to receive something much greater than a slap on the wrist. There needs to be harsh fines and suspensions. Is it too much to ask for trainers to only use drugs from an approved list? It really shouldn't be, but for some reason, the thought of this is offensive to some. Horseplayers and new potential owners (who are looking to claim or buy privately) shouldn't be totally in the dark regarding which drugs are being used either. Trainers and possibly vets should be required to list drugs and even supplements, and any medical procedures used on a horse and the reports should be available at a national database for the public to access. Violators should be fined enough so that they aren't even thinking about not reporting everything. It is 2016, there is no good reason for the game to not be transparent, for the sake of its customers. Once more, it is 2016, so why is horse racing not even using 20+ year old technology when it comes to the exact distance of a race from when the timer goes off to the finish of the race? Lengths are somewhat subjective and at best can only be used to calculate estimated times, especially horses other than the winner. The solution is to put to use, for example, GPS technology, put a device in the saddle, and accurately time all the horse in the race to the hundredth of a second. The public can then look at the past performances and decide if they want to look at the actual time or the lengths beaten when trying to handicap winners. Wind speed would be a nice addition too. It is available for quarter horse races so this shouldn't be too complicated to implement. Lets bang our heads against the wall some more. Takeout needs to be no greater than 15% on almost all exotics and 10% on win place show. And this has to be industry wide. Horseplayers, like every other gambler on the planet like to stay in action. The lower the takeout, the more they get to stay in action without having to "go to the well." The longer most gamblers stay in action with the same bankroll, the more entertainment they have, the more likely they are to stick with the particular game that is giving them that entertainment fix, and more importantly, they become more focused on that game and they are less likely to focus on the competition. The lower the rake, the more the game is perceived to be beatable both long term and short term. This is what one might call thinking out of the (claiming) box. How about giving owners the ability to claim horses after the race? Hold an auction right after each claiming race. The way it would work is each horse would do a 10 second jog in front of the camera after unsaddling, then the horse can go back to the test barn or their stable. The owner or authorized agent puts a minimum bid on their horse. The bid can be much lower than the claiming price up to 125% of the claiming price (to protect the owner in case the horse ran exceptional or lost a conditioned race by a small margin). If the owner doesn't submit a minimum bid, the bid is the original claiming price. Horses can still be claimed prior to the race. If claimed the traditional way, they do not become part of the auction. The rest are auctioned off in program order. Owners must have funds to cover their transactions in full prior to auction. Authorized agents or owners can bid, even via the phone or internet. The auction can take place in the grandstand which may get the public somewhat involved (and it also kills the excuse of too much time between races somewhat as well). The owner of the horse being put up for auction can buy back their horse as well, but any amount above the 25% allotted premium will be donated to a retired horse rescue or the Jockey's Benevolent fund. The pros of this are many. Owners buying with more confidence. Owners looking to sell their horses can get a good market value. Owners/Horsemen will be focused on viewing more claiming races than they are now, especially potential owners. The fans may get their interest up as well, enough to perhaps dabble in ownership. With more focus on these races, wagering will most likely increase as well. 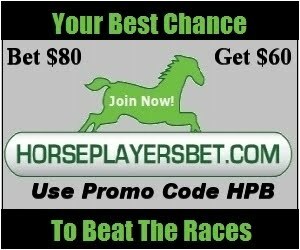 The above article was written by me for HANA's Horseplayer Monthly (July 2016 Edition): Check out the entire issue for free!